“There are no rules anymore in Washington,” a Republican ex-House member from Virginia said, after saying he wasn’t surprised by the White House’s hard-line stance that it would not respect subpoenas. Facebook and the agency have been in negotiations over a financial penalty for claims that the company violated a 2011 consent decree. Fear of new dangers swirled on Thursday, prompting roadblocks and building lockdowns. The police warned that Sufi Muslims were at risk, and Catholic services were suspended. President Vladimir Putin simplified citizenship for people in separatist-held regions of Ukraine — a move that could intensify the five-year conflict in the country’s east. The court’s ideological divide was on full display during arguments, with liberal justices appearing skeptical of the case offered by the administration. What’s new for the 2020 Census? Paper forms are out. The Internet and mobile phones are in. Here’s what you can expect for the latest decennial census. Heavy rains swept through Dallas on Tuesday night and early Wednesday, triggering flooding across the region. Texas officials announced this week that John William King, 44, would be executed Wednesday night, 20 years after his conviction in the dragging death of James Byrd Jr., one of the most notorious hate crimes in recent U.S. history. To the outside world, she appeared to be a member of a Texas family. But at home, the girl said, she was beaten and forced to cook, clean and care for children without pay. The Kremlin has said no major agreements will be signed during Kim’s meeting with Vladimir Putin, which is expected to take place behind closed doors. After unilaterally withdrawing from the nuclear deal, the United States placed sweeping sanctions on Iranian officials and sectors of the country’s economy. Now, it’s raising the stakes for other major powers. Professors Benny Tai and Chan Kin-man will serve 16 months imprisonment on public nuisance charges. A third founder, the 75-year old pastor Chu Yiu-ming, also received 16 months but will not serve time in jail due to his age and contributions to society. The 29-year-old journalist was shot by a dissident republican. After the Arab Spring, Saudi Arabia and the UAE were accused of backing counterrevolutions to restore order in the region. This Web site provides news, information and insight into the rapidly changing world. It includes links to both liberal and conservative news outlets to help those who honestly seek to understand what's going on to easily access news and views from both sides of the political spectrum and from global news outlets, as well. DESTROY THE PRESIDENT AT ALL COSTS! 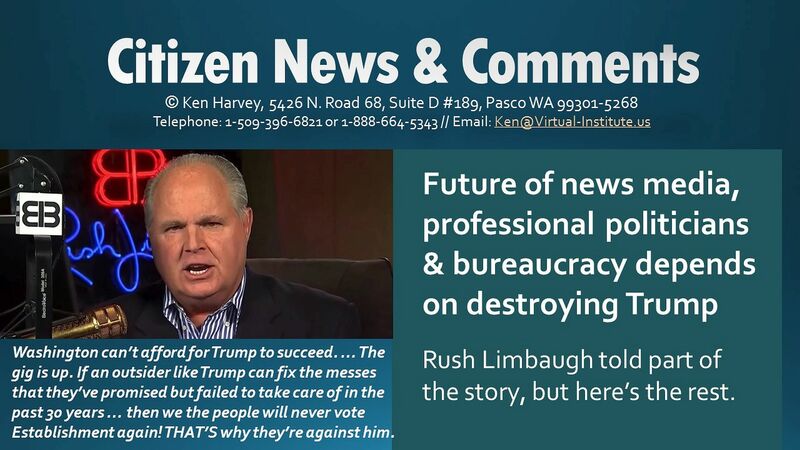 Rush Limbaugh pointed out that the Establishment (aka the Swamp) cannot allow Trump to succeed. They must oppose him at every turn. If he succeeds, he will demonstrate that Establishment politicians were too stupid to solve the problems or didn't actually want to solve the problems facing America. For example, after nearly 80 years of conducting our so-called War on Poverty, how close are we to winning it? Actually, we're going backwards. The programs implemented to solve problems created worse problems. For example, some of our biggest economic and social problems in America relate to single-parent families and children without dads. But welfare policies penalized impoverished women for having the father in the home, so in some inner cities now 80% of all children are born into single-parent homes. When the War on Poverty began, African-American families were among the strongest, but not anymore. Welfare reform passed by the Republican-controlled Congress was based on principles that could have fixed many of the welfare system's problems, but bureaucrats and liberal politicians clearly did not want them fixed. In theory, welfare recipients were required, if they wanted welfare, to accept a low-paying job or internship or to seek training to prepare for a job. They were given 7 years to prepare to end their welfare dependence and were provided child care funding, tuition for training, and other support to achieve that. So, what occurred? In the first few years welfare dropped in about half because many recipients apparently did not want to comply and voluntarily gave up their benefits, raising questions about whether they ever really qualified. Then the numbers started rising again, and rising and rising. Many of those who pretended to comply were practicing very effective passive resistance. They showed up for classes but refused to cooperate with the instructors. I was on the board of directors of one of the contractors assigned to provide training. Most of our employees were liberal Democrats, but our trainers reported to us that they were unable to even teach their trainees how to answer a business phone correctly in order to work as a receptionist. Obviously, the trainees could have learned that if they really wanted to, but they were just there attending class to keep their benefits going. Meanwhile, 7 years, 8 years and 9 years passed. The state welfare bureaucracy in Democrat-controlled Washington State serves as an example of why reform didn't work. I interviewed a regional welfare director 10 years after reform was passed. During that time not ONE (1, uno, adeen) recipient in the state had yet been kicked off welfare, no matter the level of their non-compliance -- including those able-bodied individuals who were just sitting at home watching TV the entire time. Meanwhile, welfare fraud is rampant, and the new programs such as child care for working moms have provided more opportunities to defraud the government. I know one mom who never qualified for child care but according to very reliable but second-hand (hearsay) evidence from her mother and sister, she defrauded the government to the tune of about $50,000 because no one bothers to check EVER if the children's father is in the home and providing additional money to support the family. The regional welfare director also informed me that they are forbidden from asking any applicants about their legal status. Another reason such problems have never been fixed is that any effort to do so immediately encounters opposition and political attack not just from the Democratic Party but also from the liberal media. We have witnessed to what degree the media currently acts more like the propaganda department of the Democratic Party. The percentage of negative stories about Trump outnumber positive stories 9:1. Their sources are mostly anti-Trump sources, with a few supporters thrown in towards the bottom half of the story. The framing and tone of most stories are almost always negative. And some of the subjects getting major play are absurd and would NEVER have been employed against a Democratic president, such as, would Trump have REALLY gone into the school to try to stop the gunman? Would Obama? Would 90% of our politicians? But how do the media stop the Republicans from passing reform? Because they are also politicians and many Republican politicians are very stuck in the swamp along with the Democrats. They will not challenge the liberal media as has Trump. They enjoy excellent salaries (despite their declarations of poverty) and lush benefits too much. The media have their own reasons why they MUST destroy Trump. 1) Most of the newspapers have lost 2/3 of their advertising because of the internet. The other traditional news media are also losing revenue, and I have published a couple of book chapters recently showing evidence that TV has now hit the economic "tipping point" that newspapers hit about 12 years ago. All of the traditional news media are struggling to prove their value to their remaining followers. But if they focus all their resources on Trump and fail to destroy him, their efforts will totally backfire. Their readers and viewers will eventually realize that the media were just blowing smoke and all of the smoke they are blowing is just a failed con. 2) WikiLeaks already demonstrated how pitiful the traditional media were in uncovering or reporting the facts. Four years after Obama, Hillary, Susan Rice and others openly lied about the circumstances surrounding Benghazi, only WikiLeaks finally forced them to very weakly admit it -- and still totally underplayed it. Obama may not have defeated Mitt Romney if the mainstream media had done their job. Their lies in 2012 were much more effective than any Russian effort in 2016. Conservative media that the Democrats and the liberal media like to link to "fake news" were reporting the Benghazi story quite accurately within a couple weeks after the event. It was the first time I had gone to some of those websites. I could see that some were not done very professionally and communicated with one that they needed to comply better with journalistic norms. I am pleased to see now that they have. But, regardless, they presented the basic facts of the story that the Democrats and liberal media denied for four more years. Last year I made the statement and still believe it to be true that during the 2016 election WikiLeaks became the most credible news source in the world. Notice to what degree the media and the Democrats are trying to destroy WikiLeaks at the same time they are trying to destroy Trump, doing their best to link them both to the Russians. After more than a year of frantic efforts, they have not proven their case against either one. However, regardless of how WikiLeaks secured the documents, the Democrats never denied any of the thousands of important revelations WikiLeaks exposed during the 2016 campaign. In fact, the liberal media and the Democrats did their best to simply ignore those revelations. Probably most Democratic voters are hardly aware of all the emails and memos WikiLeaks exposed, showing deceitful efforts by Democrats regarding Benghazi, the Democratic Party's sabotage of Bernie Sanders' campaign, and many other important issues. With the media's ongoing and relentless attack on Trump, they are essentially doubling down. If their efforts fail this time, and considering their weakening economic status, many of them will soon be closing their doors. Very few of them have achieved any significant success in moving their advertising and subscription base online. If they fail to "expose" Trump as some kind of devil, they will fail to demonstrate any reason for their audience to follow them over the cliff. Former Vice President Joe Biden, in an online video Thursday, officially declared his candidacy for president in 2020, capping off weeks of intrigue and media speculation. China says it has complained to France after one of its warships entered Chinese territorial waters while passing through the Taiwan Strait this month. Italian leaders are holding observances on Liberation Day, which celebrates the end of the country's fascist dictatorship during World War II, with appeals against glorifying dictator Benito Mussolini. A Tennessee man beat a 4-month-old boy to death earlier this month after finding out the child was not his son, authorities said. BETHLEHEM, W.Va. (AP) - A West Virginia police officer accused of stalking an underage girl has posted bail and been released from custody. News outlets report 29-year-old Bethlehem police Officer Daniel Eastham was arrested last week and released from custody Tuesday. He's not allowed near the school or girl. NEW ORLEANS (AP) - Federal authorities say a Louisiana woman has been sentenced to two and a half years in prison for stealing more than $2 million from her former employer. COLOMBO, Sri Lanka (AP) - Sri Lanka's former navy chief says father of 2 Easter suicide bombers arrested on suspicion of aiding his sons. WASHINGTON (AP) - Video of a Washington, D.C., police officer chasing and handcuffing a 9-year-old boy on Monday has prompted a review of police practices. ARLINGTON, Va. (AP) - Reagan National Airport will host a full-scale airport emergency drill this weekend. TOKYO (AP) - The ambiance was friendly. Nice, comfy seats. An exchange of polite welcomes. VLADIVOSTOK, Russia (AP) – Russian President Vladimir Putin sat down for talks Thursday with North Korean leader Kim Jong Un, saying the summit should help plan joint efforts to resolve a standoff over Pyongyang's nuclear program. VLADIVOSTOK, Russia (AP) - Putin says Russia supports Kim Jong Un's efforts to normalize North Korea's relations with the United States. Dozens of people, including supporters and two sons of Nevada rancher Cliven Bundy, rode ATVs and motorcycles into a protected Utah canyon on Saturday in defiance of federal rules governing the use of Western lands. It remains to be seen if Rep. Trey Gowdy, the chairman of the House select committee chosen to investigate the Benghazi attack, will have access to all the information that he needs, says Pete Hoekstra, former House Intelligence Committee chairman. Republicans and conservative groups applauded the decision on Friday by House Speaker John Boehner to schedule a vote next week to create a select committee to investigate the 2012 Benghazi attacks that killed four Americans. To transform brain signals into speech for people who cannot talk, neuroscientists have designed a groundbreaking device that utilizes artificial intelligence technology, according to research published in the Journal Nature. New Navy guidelines for its personnel to report "unidentified aircraft" are being constructed to help study the instances, rather than ignore them, according to Politico. Pediatric blood pressure guideline changes issued in 2017 increase the number of children diagnosed with high blood pressure, a new study finds. America's couch potatoes are becoming ever more deeply rooted, and computers are the reason why. The post At Thanksgiving, big grocery & big labor attack competitor Wal-Mart appeared first on Human Events. Why is the media in denial? The post The Knockout Game — NYT/NPR say no big deal appeared first on Human Events. Thanksgiving’s meaning is so subtle that it’s liable to get lost amidst the hustle and bustle of the holiday season. The post Celebrate Thanksgiving, not ‘Black Thursday’ appeared first on Human Events. Learn about this item from the NRA's National Firearms Museum. The post Video: Meet John Alden’s wheel-lock rifle brought over on Mayflower appeared first on Human Events. Is it too soon to say‘I told you so’? In anticipation of a return to the glory days of David Dinkins, let me be the first to say, I told you so. ‘I told you so’? appeared first on Human Events.